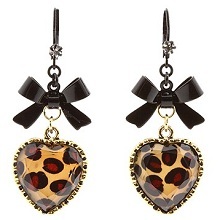 Showcase a wild streak with these ravishing Betsey Johnson earrings. Gold-tone hardware with leopard enamel heart, black-plated bow and closure, and tiny clear crystal at post. 3/4 wide with a 1 1/2 drop length.